Our cute little Green ball spitting frog is back in his greatest adventure ever !! Zuma’s Revenge is possibly the one of the best puzzle games ever made, the amount of new content that’s been added to Zuma’s Revenge will make your head spin. From power-ups including three new shots, reverse, slow, lasers and even cannon ball shots. There is a new lily pad jump moving you from one spot to another creating a more complex and challenging style gameplay, to a controlled slide shoot and aiming mechanic. Combine that with new bigger and badder end of level BIG BOSS Battles, where you have to not just worry about taking down the Boss of the Island section but also ensure that you still connect and hit your colored balls and match 3 or more of a kind of the same color. With 60 challenging levels and 4 game modes Zuma’s Revenge is fun for the whole family, even grandma and grandpa can join in on the fun. With the multiple profile setting you can login/create a profile for each member of the family this way everyone can login to their own profile and continue where they left off without having to worry about someone jumping in and deleting or continuing from your saved spot. 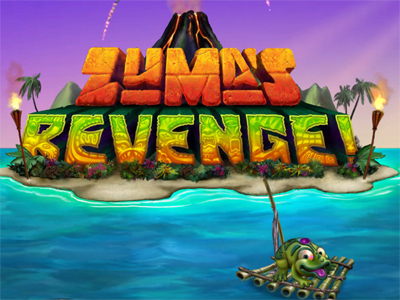 Graphically Zuma’s Revenge is possibly one of the best looking puzzle games made by PoP Cap Games and certainly by far the most challenging, with so many modes and the new added features of the BOSS Battles Zuma’s Revenge is a title that shouldn’t be missed. Check out the video review below and see our little green buddy in action ! !